Ideally, every relationship should be better than the previous. Lessons learned should carry into the next relationship to minimize petty arguments due to one not being aware of their annoying behavior. Specifically, every girlfriend should leave the man better than she found him. It is common courtesy. One should take honor in the work done in her prior relationships to lessen the headaches on the next girl. So it is expected that by the time a man enters his mid twenties- early thirties, he has had enough significant relationships to have learned the basics to avoid unnecessary dissent in the new relationship. So here are 8 things your last girlfriend should have taught you. 1) To Take Out the Trash…without being asked. You see the trash. You smell the trash. You continue to stuff things at the top of the trash until it absolutely can’t hold anymore. At this point, you are expected to be proactive, and when you see the trash full to take it out. Your girl can take it out, but if you are there why would you want her to? 2) How to Dress in Your Size- Medium. Why are you still buying XXL shirts when you are a medium? And who still sags? Buy your 34 waist jeans. It is okay. You are grown. No one will think you are less than a man if your clothes actually fit on the weekends too. 3) How to Match: You don’t have to be a fashionita by any stretch of the imagination but it is expected you to know that black shoes and a brown belt do not go together…neither does white socks and black shoes…nor do dark shirts with light shoes. And it is assumed you to have shoes other than Jordans and dress shoes. A nice causal loafer is a must. You just need the basics because no wants to have to dress you every day. 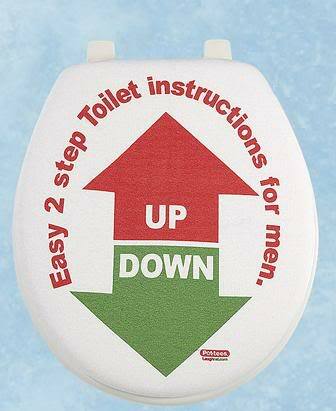 4) To Let Down the Toilet Seat Every Time. Yes. Every Time. Enough said. 5) To Properly Groom Yourself. Impeccable personal hygiene is a must. No one wants a funky man lying around their house. But beyond that your netherlands region should not resemble the jungles of Jurassic Park. Take care of that. That is all. 6) How to Effectively Shop for Tampons. You should no longer think they are all the same. Or should you still be bashful about getting them. A gem is the man that asks the appropriate questions to make sure he brings back the right kind. A keeper is the man that knows to also bring her back a pint of her favorite ice cream. 7) The Hair Process. You should know it takes time. If you want to be spontaneous and surprise your girl with a surprise date, that’s great and sweet. If her hair needs to be nice for such an event then give her notice so your girl can enjoy the event without being mad at you because her hair is not how she would have liked it. 8) How to Handle the Groupies. No woman wants a man no one else wants. Women should expect other women to come at you, it is a compliment. However, at this age you should know how to handle them without any assistance from the misses. …Any others you would add?